As if my family needs another excuse to grill, July is National Grilling Month. And, to help celebrate, Pompeian, a leading brand in oils and vinegars is sharing simple tips and recipes to help get your summer started. You can try out these recipes for a taste of the Mediterranean from the comfort of your backyard. Fat is usually considered a dirty word but not all fats are created equal. 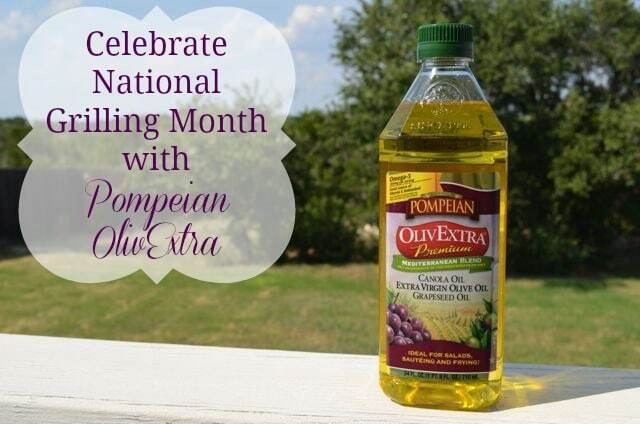 Fats like those found in grilling essentials like Pompeian Grapeseed Oil and OlivExtra Mediterranean Blend are good for you and can actually help you achieve your nutritional goals without sacrificing flavor. Plus with high smoke points, the flavor combinations of these oils make them the ideal base for all sorts of dishes from dressings to marinades. This weekend my family and I tried out the Pompeian Mediterranean Blend on two different dishes featuring a dressing and a marinade. 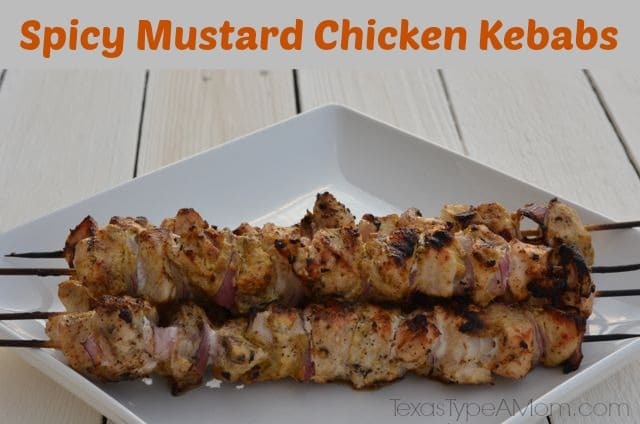 Lisa Lillien, aka Hungry Girl, created three mouthwatering grilling recipes including Hungry Grilled Romaine Salad, Jalapeno Peach Shrimp Skewers, and Spicy Mustard Chicken Kebabs. Perfect for any summer occasion that feature Pompeian! We tried two of the three creations and were not disappointed. I know you’ll be equally pleased at how delicious and simple these recipes are to make. Bring grill to high heat. Drizzle and brush 1/2 tsp. olive oil onto the cut sides of each romain half. Sprinkle with salt and pepper. Lay romaine halves on the grill, cut sides down. Grill until slightly charred, 1-2 minutes. Plate romaine halves, cut side up. Top with tomato, onion, cheese, and basil. In a small bowl, whisk vinegar and remaining 2 tsp olive oil. Drizzle and enjoy! With temperatures in some parts of the country (including Texas) that have already hit the triple digits, make sure you stay cool this summer by keeping the heat off in the kitchen and turning things up outside with Pompeian! 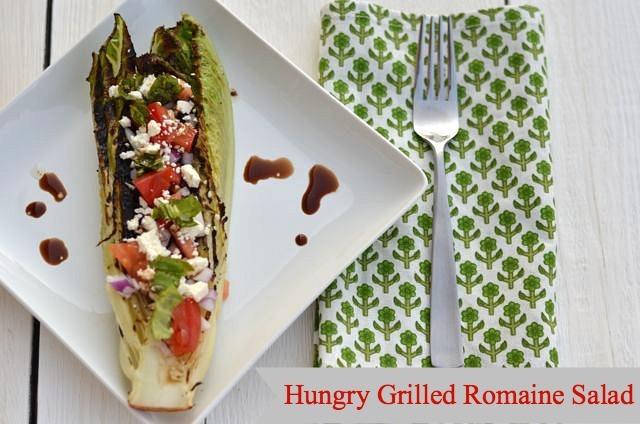 I’ve only grilled romaine once for a Caesar salad recipe. This looks fantastic. I don’t have feta on hand, but I have blue cheese. I bet that would work good too. This total meal looks delicious! I don’t think I’ve ever grilled romaine before. Something to try! I’ve never tried grilling lettuce like this before, but I’ve been meaning to. I had grilled kale last week and it was amazing! Wow, that does look delicious! Thank you for that fabulous recipe! K, that looks delicious, seriously delicious. I tried grilled lettuce at an event this Spring and was surprised by how it brought out some flavors! I absolutely love making food inside lettuce. This is how I do my tacos, sandwiches etc. So good! Those kabobs look great! 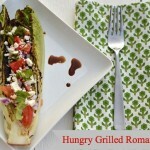 The grilled romaine looks awesome! This is something we must try soon!! mmm that salad looks delish!